I stumbled across this little gem of a blog yesterday, and put out a twitter link to it that instantly became my most wide-spread Re-tweet to date. It’s an aggregation of the very worst in theatre production stills culled from the wilds of the internets, and manages to be heart-wrenchingly sad and murderously funny all at the same time. – Take a shot of Southern Comfort if there’s Equity leads in the foreground somehow oblivious to some minor character emoting real hard at them…while standing only three feet behind them. -Take a shot of Vermouth if a child actor is being used more…more like a prop than anything else, by the looks of it. – Take a shot of Cognac if that family looks like maybe, maybe it’s finally Coming-To-Terms with that thing that happened 17 years ago this Christmas. You’d better believe I scrolled through these in dread of finding the ghost of some old production past in there…enjoy! PS: Rebecca’s got a great post about the art of the production still over at Art of the Biz…. 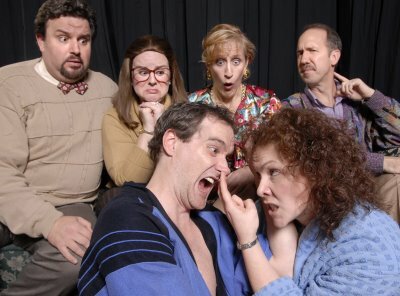 The photo above is from Phoenix Theatre’s presentation of “How the Other Half Loves.” These actors are hilarious – unfortunately so is the judgment of the marketing director. Great grab!